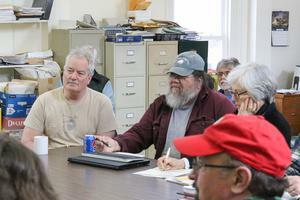 Penobscot Comprehensive Planning Committee members Ed DeVito, left, Hans Carlson, and Maggie Williams discuss the group’s decision-making processes during the committee’s first official meeting on March 23. The comprehensive planning process in Penobscot is officially under way. The comprehensive planning committee met for the first time on March 23 to discuss the logistics of how the committee and volunteer working groups will proceed, as well as to decide on official procedures. Liz Leclerc, who has been leading the charge in an unofficial capacity along with Jon Albrecht, was elected as committee chairman, with Albrecht as her vice chair. Co-secretaries Ed DeVito and Virgina Liberatore were also elected during the meeting. After introductions, the committee spent much of the next hour discussing its decision making procedures, and whether to make their decisions by consensus or majority vote. Several committee members, and members of the public in attendance, felt that the decision making should be done by a combination of both majority vote and consensus, in order to keep issues from holding up the overall planning process. Because the comprehensive plan will ultimately be an official document presented first to the selectmen and then to townspeople to vote on, the committee agreed to votes on the various aspects of the plan for documentation purposes. It was suggested that the group work toward consensus, and if they are not able to come to one by the end of two meetings, a vote by super majority (two thirds vote) will be taken. That suggestion was approved, and the members decided to make their future decisions with those guidelines. Along with official committee members, volunteer residents will also be working on the comprehensive plan through working groups, which will research issues forecast for the future of the town. Those groups will then take their research to the committee, which will make the decision for inclusion into the official plan. Meetings of the comprehensive planning committee have been scheduled for the second Tuesday of the month at 6 p.m., and the fourth Saturday of the month at 9 a.m., in hopes of “being available for people in town with different schedules,” according to Albrecht. Meeting notices will be posted at the transfer station, Northern Bay Market, post office, and on the official Penobscot town website. The next meeting is set for 6 p.m. Tuesday, April 9. 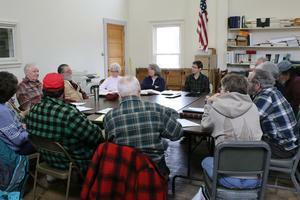 The Penobscot Comprehensive Planning Committee met for its first official meeting on March 23. 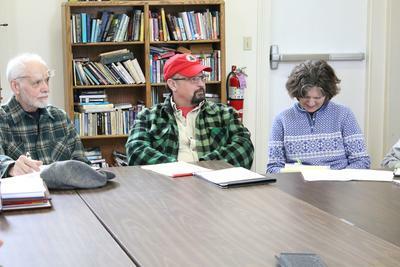 Members of the Penobscot Comprehensive Planning Committee, including Liz Leclerc, left, board of selectmen liaison Phil Rapp, and Bailey Bowden, introduce themselves at the beginning of the group’s first official meeting on March 23.